Anybody can like Citizen Kane. If you're truly passionate about film, a disciple of celluloid, then you appreciate the cringe-inducing cheapness of Bad Cinema. There's charm in the wild abandon with which clueless filmmakers throw themselves into the craft. The best bad movies are watchable for the sheer delusion (necessary for their existence) that bleeds onto the screen. Eureka Theater celebrates the schlock over two nights of Z-grade drive-in double features on Friday, Oct. 17 and Saturday, Oct. 18 ($5). Also, cocktails! 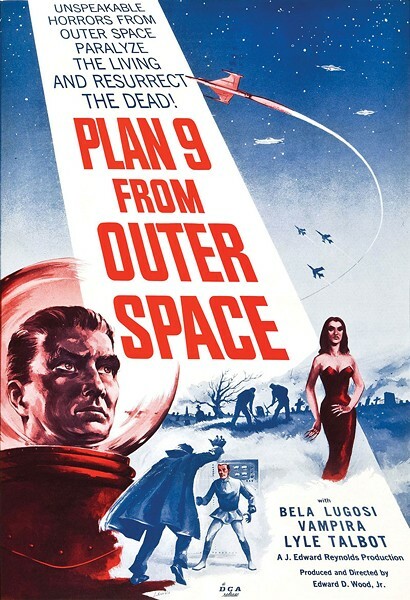 Friday's double bill features trash-auteur Ed Wood's minorpiece Plan 9 From Outer Space at 7 p.m., a mind-numbing sci-fi flick with performances as wooden and flimsy as its sets. Follow that with the neo-sleazy Birdemic: Shock and Terror at 9 p.m., which Flavorpill called "so wildly incompetent ... that it really must be seen to be believed." Maybe read a book, then catch Robot Monsters on Saturday evening at 7 p.m. — the poster features an iguana, a rocket ship and a babe in the grips of a skull-faced "astral assassin." Don't worry, Bad Cinema has a happy ending: Riff masters Mystery Science Theater 3000 take on caveman epic Eegah at 8:45 p.m., delivering all the witty barbs you wish you could hurl at the screen.